Why choose an Exhale bladeless fan? For your offices and storage areas. Provide a serene environment for your staff! Reduced prices for the sponsor and sponsored! Due to the patented technology the Exhale fan is able to create a gentle relaxing breeze all around the room. 1 - The Exhale fan is quiet, even at maximum speed its sound volume lies between 40 and 45 decibels. 2 - The Exhale fan provides financial savings thanks to its patented technology combining energy efficiency and the maintenance of a constant temperature, functioning perfectly alongside your air conditioning or your heating. 3 - The Exhale fan has a calming effect. Even at high speed it does not blow papers around, you can relax or work in peace! 4 - The Exhale fan is elegant. Its refined spherical style, with no visible screws, fits in perfectly with all styles of interior. 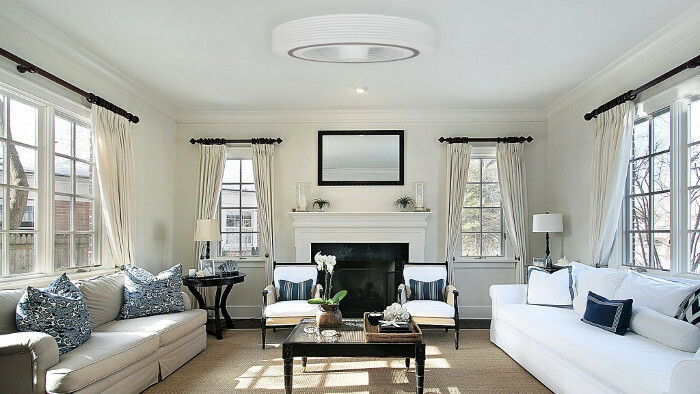 5 - The Exhale fan is a real alternative between air conditioning and the traditional ceiling fan. 6 - The Exhale fan is easy to instal. How does the Exhale fan work? For any questions, please fill out the form. The bladeless Exhale fan creates a 360° VORTEX airflow by drawing in air from below and redirecting it out over the whole area of the room. The temperature is stabilized in 90 seconds. Reduce your impact through thermal destratification (find out more below). The air is distributed around the room in only 90 seconds with the Exhale fan. The real technological innovation lies in the air flow (Vortex) distributed at 360 degrees to achieve total ventilation of the room. The multi-directional flow is felt all over the room and creates a relaxing environment to all its occupants.